Tab. II. Europae, Hispaniam ac Lusitaniam Complectens - MERCATOR,G./ HONDIUS,J. Title : Tab. II. Europae, Hispaniam ac Lusitaniam Complectens. Size : 13.2 x 17.0 inches. / 33.6 x 43.2 cm. Description :An attractive Ptolemaic map of the Iberian Peninsula. 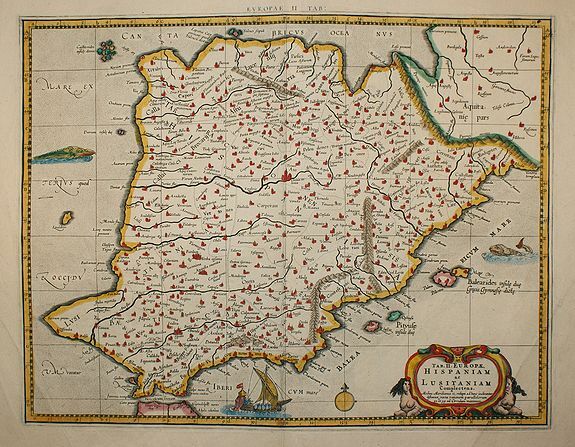 Mercator originally published this map in his 1578 edition of Ptolemy's great Geography. Condition : In good condition. Visible folds on the lower edges.